with 900 of the leading providers and see in-person, in-action how their efficiency-enhancing and cost-cutting equipment and technology solutions can futureproof your supply chain. from the industry’s best minds how key industry trends and innovations can transform your manufacturing and supply chain operations during 100+ free education sessions and four powerful keynotes. with your industry peers from the U.S. and over 110 countries across the globe. Whatever manufacturing and supply chain solutions or insights you need to FUTUREPROOF your business, you’ll find them at MODEX 2018. There is no cost to attend the exhibits and conference sessions. Register today for free admission and download the MODEX app to customize you MODEX experience! The smell of spring comes. Erica saw it and share with you the beauty of this moment. A solo piano brief in Shanghai-Played by Austrian pianist -Cornelia Herrmann. She played very well, impressed me with Mozart’s famous classic. I like her, though she did not speak anything on the show in Shanghai Daguan theater, music was her voice. Since music told everyone at present her soul and her heart. That was all that she wants to say. Young Austrian pianist Cornelia Herrmann, who stood in for Markus Schirmer, proved a real stroke of luck which was appreciated by an enthusiastic audience. Her performance was a fine and noble version of KV 467. Here I would like to introduce some logistics transport vehicle trend. GESM will be producing the new logistics transport vehicles in mass from Oct 2018 forward on. Welcome to visit our factory then. For more details, please email to alex@demolead.com. If a pedestrian walks into the “blind spot” of a forklift truck, there is potential for an accident to occur. The driver may not notice the person before it is too late, or even not at all. “Surround View” system will prevent such hazardous situations from arising in the first place. Via the “Surround View” system, the image display is still based on live data from cameras mounted around the truck, but instead of a single overall image, the system generates a front, a rear and two lateral fields of vision. The big advantage of this solution is that the camera views are displayed 1:1 as a split screen on the monitor at the driver’s workstation. If there is someone in the overlapping area of two cameras, they will be displayed in both fields of vision. 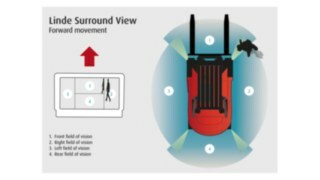 Surround View System ensures greater safety in narrow warehouse areas and during frequent maneuvering. The camera views are displayed as a split screen. When driving forward, all four viewing areas are shown in the display by default. During reversing, the display changes to the rear and two lateral fields of vision. When driving forward, all four viewing areas are shown on the display by default. During reversing, the display changes to the rear and two lateral fields of vision. The driver therefore recognizes possible collision hazards early on. And this does not only apply to pedestrians around the forklift: Damage to goods, shelves and the forklift itself can also be avoided by the extended view. More visibility also means higher productivity. Drivers can work more efficiently, quickly and ergonomically. For example, during storing they can see what is going on in front of the forklift arms – even if the load obstructs visibility.